Journey through tried-and-true Casual Luxury techniques--for decorating, entertaining, gifting, cooking, and more. From quick and simple to full-scale projects, Mar helps you create with style. I love to get mail. Don’t you? There is a little bit of excitement wondering if there is going to be a letter or a card waiting for me. One can only hope, as most often it’s the monthly bills or the endless amount of waste commonly called junk mail. For me and perhaps you, discovering something handwritten always trumps an email. Did you know that the first and oldest recorded mailbox in the U.S. was set up in 1863 in East Quogue, NY? The current style of mailbox with its curved, funnel-shaped top, latching door and movable signal flag was designed in 1915 by Roy J. Joroleman, a U.S. Post Office employee. While new materials, shapes, and features have appeared in recent years, the United States Postal Service (USPS) retains the authority to issue specifications for mail receptacles and curbside mailbox construction, thus limiting innovations in product diversity and design. That’s not a problem for me. With a little creativity and vision, mailboxes don’t have to be cookie cutter replicas of each other. When the builder was putting the finishing touches on Rosebrook Gardens, one day I asked him where he planned to put the mailbox. He replied at the end of the block. Well, you know me! I marched straight down to the corner to see it for myself. Here amongst a miss-matched, paint-peeling, busted and rusted accumulation of tired out metal boxes was one, lone, bright and shiny, brand new mailbox. I thought to myself, clearly the Pony Express is alive and delivering here. This just wouldn’t do for me or my new neighbors. I quickly realized that I would have to take matters into my own hands. My street is filled with charming homes and the time had come for a cohesive aesthetic design that would truly represent the homes and homeowners on our little private street. Trust me when I tell you it was time to pro-actively seek out a modern solution that offered both form and function. “¢ A wonderful opportunity to show individual style that represents you, your home and your neighborhood. Look at it this way. Right or wrong, don’t people often judge a book by its cover? The mailbox sets the tone of the home and the homeowner. When I seek out real estate properties for friends, I definitely look at the mailbox because this often overlooked detail is a good example of what I am likely to find inside and outside regarding the maintenance of the overall property. Mailboxes come in a variety of shapes, sizes, and colors and with so many options today, it is a wonderful place to create visual interest, not to mention an additional gardening opportunity when located at the edge of your property. A clematis or climbing hydrangea offers curbside beauty that not only welcomes the mailman but anyone looking to drop off a personal note or small package. A curb-side mailbox also offers seasonal opportunities to express your creativity. Summer is a great time to plant your favorite annuals while pumpkins and cornstalks in fall let everyone know that Halloween is not far off. During the holiday season, holly and a big red ribbon or bow makes everyone smile and reminds children that Santa is coming soon. I love that something so functional and necessary can also be a source of creativity and joy! Upgrading your mailbox is something you can choose to do yourself or you can hire a professional. The easiest way to transform a mailbox is with a simple coat of spray paint and some new numbers. The biggest transformation comes when neighbors come together to create a mail station that includes multiple matching mailboxes. This is a great idea for small private roads and cul-de-sacs. It can truly set the tone for your entire street. While taking a walk recently I found a good example of what not to do! So much so that it inspired me to write this article. I must say that this is, without a doubt, the worst mailbox station I’ve ever seen. It looks more like a dumping ground than a place to receive and collect mail. 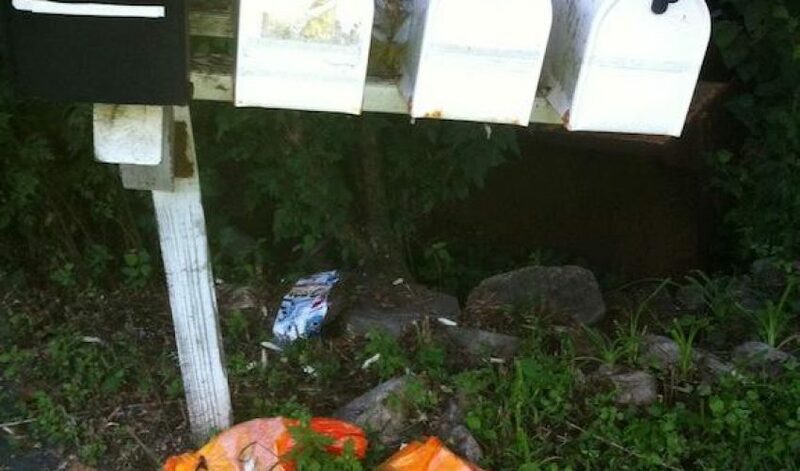 I wanted to clean it up myself as it was a sad collection of drooping, miss-matched mailboxes and worse, old phone books that looked like they had been sitting there for months. This dreadful eyesore screamed to me, “We couldn’t care less”! But we should care. Why? With four homeowners, surely one would take the initiative to clean up the mess. As a visual person, I find this so unappealing that I really and truly feel for the mailman who has to deliver to these mailboxes. In addition, this eyesore is on the main road where mothers with strollers, dog walkers and tons of traffic pass by every day. My passion for repurposing blossoms with this type of project. All you need to do is re-imagine. Anyone can fix a rusty mailbox. All you have to do is take the first step. Picking up the old phone books, adding another post and spraying them all one color could easily transform this from drab to fab. Whether you have your own individual mailbox or share a mail station, it’s the first thing that people see when coming to your home or street. I’m sure you can make it aMARzing.